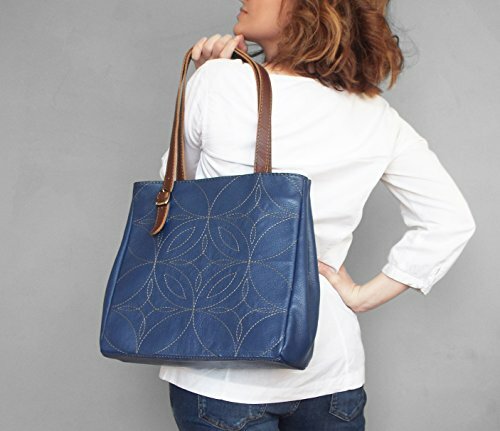 Functional and original blue leather tote bag made of supple blue natural leather and brown leather for the handles. The front and the back are embroidered with contrasting thread, which gives its unique look. It is lined with matching cotton fabric, closes through metal ykk zipper. It features 3 interior pockets: 2 slip pockets on one side - one for small items like cell phone and keys and one for your pens/ pencils and zipper pocket on the opposite side. It is very spacious and designed it to be your perfect all day bag or weekend companion! Size: width - 11.5 "/ 29 cm (buttons closed) width - 16.5" / 42 cm (buttons opened) height - 12" / 30 cm depth - 5" / 13 cm handles length - 23 - 25" / 60 - 64 cm The bag will be sent through registered, priority airmail. If you have any questions about this product by 5plus, contact us by completing and submitting the form below. If you are looking for a specif part number, please include it with your message.